C.S. Lewis' timeless adventure, "The Chronicles of Narnia: The Lion, the Witch and the Wardrobe," has been adapted for the big screen. The story follows the exploits of four siblings who enter the world of Narnia through a magical wardrobe. While in their newly discovered land, they learn a lot about themselves and their family. 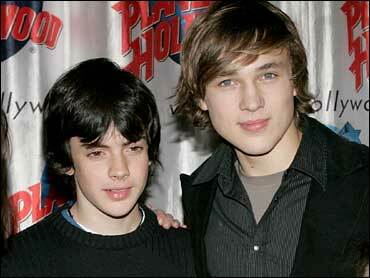 In the movie, 18-year-old William Moseley plays Peter Pevensie and 14-year-old Skandar Keynes plays Edmund Pevensie. They spoke to The Early Show co-anchor Rene Syler about their roles. The Pevensie children are transported from war-torn London into Narnia, a land that holds a mythical menagerie of fauns, centaurs, giants, satyrs, dwarves, minotaurs, minoboars and talking animals. Skandar, while playing Edmund, grew 6 1/2 inches while making the movie, so he had to have his armor adjusted weekly. The young actor also can play the cornet and flute. He also studies tae kwon do. He was 9 years old when he began his acting career with a role in the Royal Shakespeare Company production of "Macbeth" for British television. He also can ride a horse but he is not an expert. He and William told Syler that in one scene, when he was riding a horse, he actually tried to tell the horse to go left. Instead, the horse took a right and then jumped. "I ended up sitting on his neck," Skandar said, as William chimed in, "I was laughing so much!" In "The Chronicles of Narnia," Edmund Pevensie is the most boisterous and mischievous of the family and, once in Narnia, finds himself dangerously tempted to join forces with the White Witch. Is Skandar like that in real life? "In ways, I am," the young actor replied. "I can be like him in ways. Not entirely like him. I'm not as evil." William Moseley, as Peter Pevensie, is making his movie debut in "The Chronicles of Narnia." His father is English cinematographer Peter Moseley. A native of Gloucestershire in the Cotswolds area of England, William was first spotted by casting director Pippa Hall seven years ago when she was casting a British TV movie. She kept her eye on him over the years that followed, which led to his first audition for "The Chronicles of Narnia." The eldest of the Pevensie kids, Peter leaves London a child yet becomes a brave, grown-up leader fighting for the forces of good while in Narnia. There are seven "Narnia" books. Are the boys looking forward to continuing in their roles, perhaps in a movie sequel? William says they have not thought that far ahead. "We just enjoy everything so much. We just tried to relish each moment that we have together as a family and as individuals," he says. "The experience we've been given is, without question, the greatest experience of our life. It's just appreciating those things."